At our core, we believe engagements are most effective when they drive action and modify behaviors. This is why we take an integrated approach to our solutions. There are three critical components one must consider to successfully provide integrated solutions. And they’re needs-based, ensuring the solutions we offer are purposeful in creating change. The business need is all about the client. Taking corporate initiatives, goals and obstacles into consideration, we recommend how to overcome challenges and achieve success. The program need determines what role elements of the program play in helping meet business objectives. We pride ourselves on getting everyone aligned on what a program needs to achieve so we only propose effective tactics. To meet an audience need, we must know who they are, what they feel and need to hear. This understanding informs how to shape the most worthwhile engagements. We listen, scale, create and deliver. Make change. Not noise. 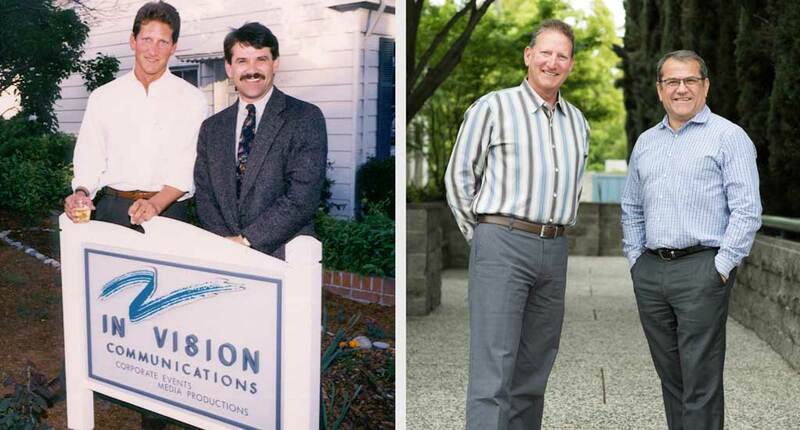 Drew Hagen and Rod Mickels in 1991 (left). Drew Hagen and Rod Mickels today (right). We founded InVision with a specific goal: to provide superior customer service, inventive thinking, and industry-leading production execution while being “good people” in business and in life. Unwavering commitment to this principle has been a driving force of our continued growth—evidenced by the trust placed in us by our clients. This proven model has allowed us to retain client relationships for decades or more, compared to the industry average of three years. Since being founded in 1991, we’ve evolved from an event production-focused company to an engagement solutions agency. We support companies in achieving business goals through the creation of impactful experiences by being insight-fueled and creatively driven. At our core, we believe engagements are most effective when they drive action and modify behavior. And we believe great work, strong relationships, and integrity are key ingredients to success. We listen, scale, create and deliver. We make change. Not noise. We all know that email marketing and your event website are two of the primary workhorses in any audience acquisition strategy. But in a world where people receive hundreds of emails a day, how can you ensure anyone is even noticing your email, let alone opening and reading it? In this article we will cover 8 tips for improving the performance of your audience acquisition email marketing. 1. Only Send to Opt-In Emails. Never buy a list! This isn’t just a best practice, it’s the law in many places. With the advent of the General Data Protection Regulation (GDPR), companies who do business in and market to individuals in the EU must obtain explicit opt-in consent before collecting personal data. But there’s an even better reason for utilizing an opt-in email list. By limiting your outreach to only those individuals who are actually interested in your event, your engagement rates are likely to be higher (due to inherent relevancy) as will efficiency. That means you should never buy a list of emails, which are unqualified at best and completely irrelevant and inaccurate at worst. Segment your audience (and your lists) and then map key messages to each audience. For example, if you’re announcing a new product, your email messaging around that product announcement might be more technically oriented for a developer audience and more business objective-oriented for an executive-level audience. Same product announcement, different messaging. On top of that, you can add true personalization, such as the recipient’s name in the greeting and/or the subject line. By targeting and personalizing the content of your emails, you’re more likely to grab the attention of your reader. In fact, according to Campaign Monitor, emails with personalized subject lines are 26% more likely to be opened. 3. Plan messaging by attendee status. Just because a prospect registers for your event doesn’t mean you should stop communicating with them. You’ll want to keep them excited about the event (especially if the event is free) to ensure they attend, but this outreach should happen at a different cadence and with different messages than what you would use with prospects. 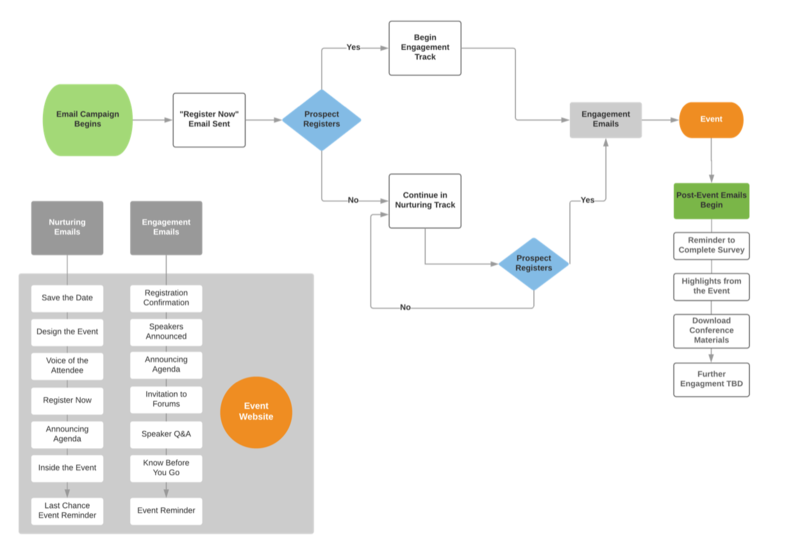 Create a dual-path email plan and use nurture messaging to drive registrations and engagement messaging to drive excitement and attendance as shown below. 4. Be emotional. And specific. If you want to capture the attention of your reader, you’ve got to resonate. To resonate, you’ve got to appeal on an emotional level. Segmenting your audience will make it easier to pinpoint what they care about, and then you can leave a curiosity gap or appeal to their emotional triggers (e.g., fear of missing out) to hook them. But you also need to balance all of this with a level of specificity that gets to the point as quickly as possible. This is especially important with your subject lines as that is the first engagement barrier you’ve got to cross. Consider these examples: 1) Hurry! Only 15 Seats Left for ExpCon with Michelle Obama Speaking; or 2) Join Us at ExpCon – Register Now! Which of these two subject lines would capture your attention? 5. Follow the rule of 7. It’s going to take a lot more than a few emails to convert your prospects to attendees. In fact, multiple marketing research studies have shown that, on average, it takes seven touches before someone will take action on something. And, when messaging doesn’t resonate with a lead, they’re less likely to move along the funnel, which means more touches may be needed. Some research says that it takes 8, 13 or even 20 touches to convert a prospect. Building a comprehensive communications outreach that incorporates the rule of 7 is a key factor in your success. But the emails must be unique, relevant and compelling. Your customers don’t want to get two save-the-date emails and five registration reminder emails. Your email campaign should tell a story that aligns with your event narrative. The effect on the prospective attendee should be one of an experience that builds and becomes richer with each communication. The emails you send should have an attractive design that is consistent with your event branding and website to ensure a cohesive experience. They should also be designed to render flawlessly on desktop and mobile, including the range of mobile devices, email clients and their various versions. The best way to achieve this is through responsive email design, but if you’re unable to deliver on this, we recommend focusing on perfecting the default preview widths (about 600 pixels) to ensure the most important content is viewable as desired. It’s probably no huge surprise that people prefer pictures over words. And in fact, research shows that images can actually significantly boost your click through rate—as much as 42% higher than emails without images. So, it’s worth it to take time to select relevant, compelling images and integrate them into your email designs. These could be images from last year’s event (to show the overall experience), an infographic (to show a concept), portraits of speakers (to put a face with a name), location and venue shots (to illustrate the environment and create a mood), and so much more. 8. A/B test your subject lines for better open rates. I introduced A/B testing in my last article on audience acquisition strategy because it’s a great way to optimize your efforts. 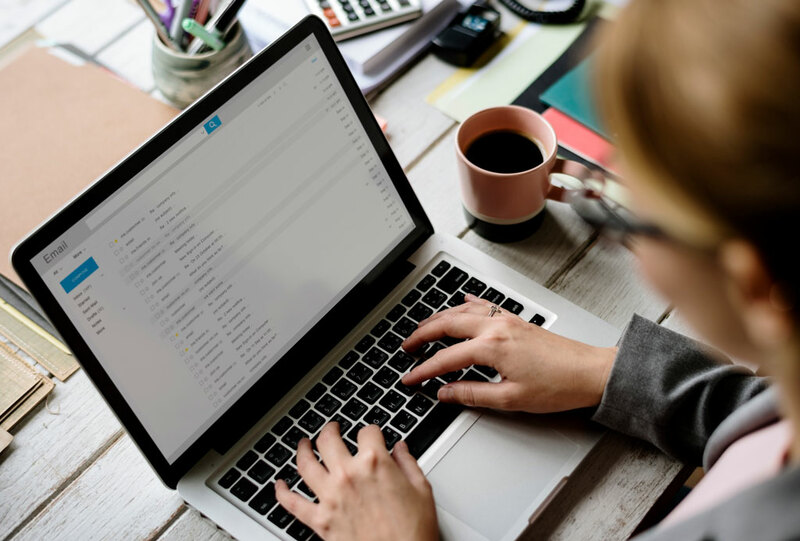 When A/B testing with email subject lines, you compare two different versions of a subject line within one email campaign to determine which version produces better open rates. Let’s say you’re offering a special registration rate but are not sure the best way to message the promotional offer. You could offer the lower rate to the first X number of people to register, or you could provide a specific window of time. Testing both options could not only give you valuable information about which option people respond to better in email, but also which promotional offer they prefer. Other things you could test are various types of personalization. You could even compare one subject line that uses emojis and one that doesn’t. Think of your email campaign as a rich story you’re telling prospective attendees as a prelude to your event. You’re providing a peek into what the experience will be with the goal of creating desire. Need help in pulling it all together? InVision has the full-service team to deliver. Read our press release or contact us to learn all about our comprehensive audience acquisition offering. Acquiring the right audience for your event may be one of the most important elements to achieving event success. But it’s not as easy as it used to be, especially with a flood of new events entering the market each year. In fact, between 2017 and 2018, the number of companies organizing 20 or more events per year increased by 17%. [i] That means prospective attendees now have more events than ever to choose from, often without the benefit of bigger spending budgets. So, it’s critical that your audience acquisition strategy stands out from the competition to give your event the edge that will attract and convert the high-value attendees you desire. This article is designed to help you pinpoint the latest skills and services you need to be successful when planning and implementing a comprehensive audience acquisition strategy. Whether you’re looking for an outside agency, a freelancer, or help from another internal team, here are 10 questions you can use to help find the right partner(s) for success. What roles will be involved in the audience acquisition strategy and implementation effort? What discovery information and data do you require prior to beginning strategy work? If your potential partners are not asking for discovery data, you might want to keep looking for another partner. Your audience acquisition strategy will have the best chance of success when built on a solid foundation of knowledge and insights. The following discovery sources can provide a wealth of useful information from which to build an audience acquisition strategy. How will you reach our target audience(s)? A good partner will be able to clearly articulate how they will segment, identify and reach your target audiences. They will also outline how they will use messaging and the attendee journey to create an engaging experience that goes beyond event registration to create attendee value during and after the event. You’ll want to listen for the inclusion of helpful tools like a messaging matrix or a messaging map, which are instrumental in developing copy that resonates with your target audiences. 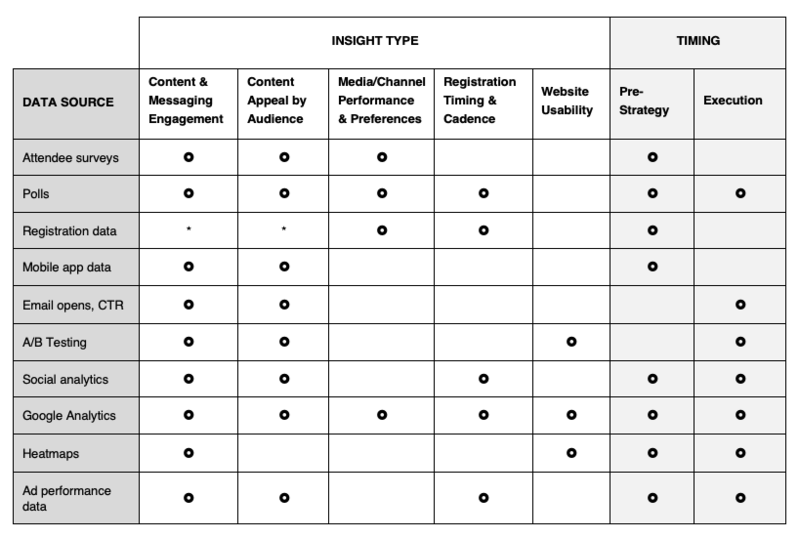 What KPIs do you recommend tracking for audience acquisition? This might seem like a simple question, but you should actually be looking for a partner who understands the importance of ROA (return on attendee). 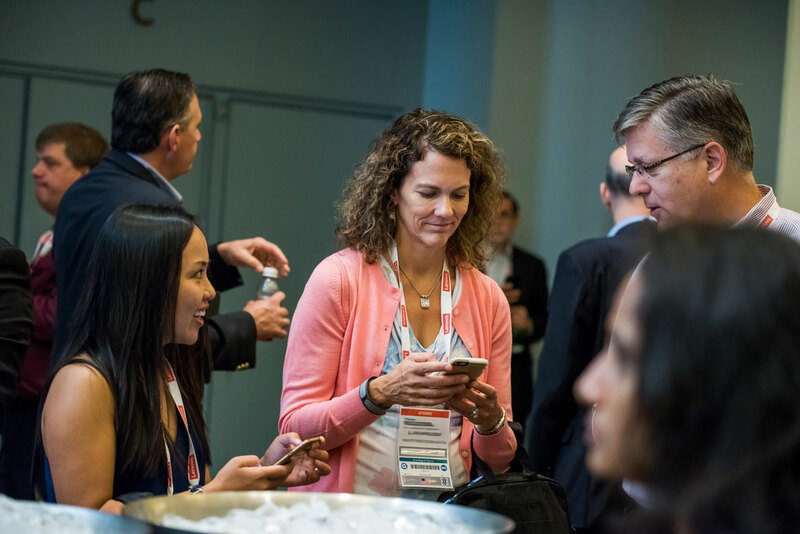 Yes, it’s important to hit registration and attendance goals, but it’s even more important to attract and engage attendees who take action as a result of your event. That’s where your investment really starts to pay off. Whether attendees are seeking more information or placing an order (or something similar), these actions work to actually move prospects along the funnel, giving you a higher ROA. Partnering with someone who can help identify and track meaningful KPIs will help ensure that you’re focusing your efforts wisely. What media channels and tactics do you typically employ? How will you work with our marketing automation team? At some point you’re going to need to send out some emails, and most likely, you own the contact database. That means either your partners will need to provide you with content that you can send (either “content pieces” that can be used in a template or a finished piece) or they’ll send the emails on your behalf using their own email platform or an API into yours. Understanding these capabilities upfront—and how experienced your partner is in delivering on this—will save you a lot of heartache when you’re working against the clock to get communications out on time. It will also enable you to proactively plan for regular reporting that is critical to optimizing your campaigns. What special skills does your team bring to the table? This is a pretty open-ended question, but it can be a good way to tease out who has that little something extra that will help you be successful. For example, an agency partner with specialized skills in messaging may have just what you need to reach a target audience segment that has been elusive at past events. Or you might find someone who has deep experience in search engine optimization (which is actually the primary driver for many event websites). 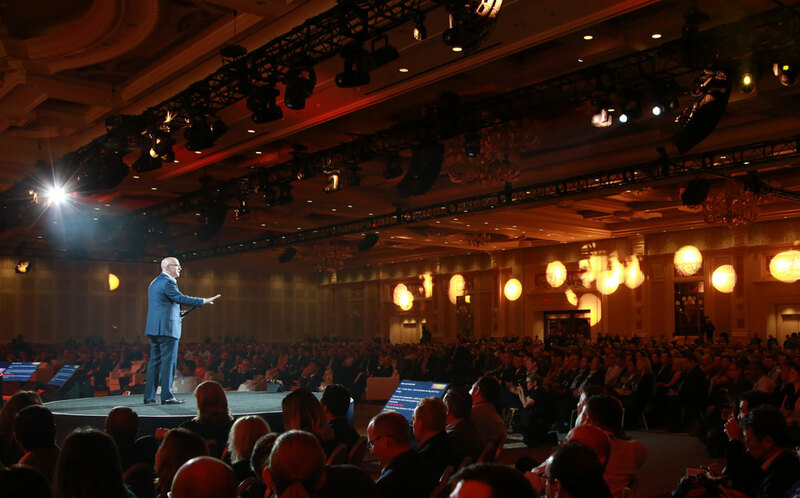 You might even find that the partner you’ve been leaning on to produce your general session can offer some unique insights into how to engage and follow up with your audience. Who will manage tracking and optimization throughout the acquisition effort? It’s important to understand who can and will be tracking the data against your key performance indicators. If there are multiple players involved, it’s good to establish who will be responsible for tracking what and when, as well as determine how that reporting will be shared. If no one is on the hook for tracking and optimization, then it won’t get done. How do you connect audience acquisition to audience engagement? With so much money being invested in live events, it’s not enough just to get people to the door of your event. For one, if your event doesn’t deliver a highly engaging experience, that attendee is not likely to return again, which means you’ll have to work that much harder to find a new attendee to fill the slot next year. Additionally, the goal of most events is not to just get people there, but rather to drive sales or increase brand/product awareness (or something similar). Your audience acquisition effort should be viewed as the beginning of this overall engagement effort, creating a cohesive attendee journey that builds on itself. If that connection is not being made, you’re only getting half of what you need. How do you close the audience acquisition loop? You might argue that it’s not the responsibility of the audience acquisition team to also follow-up with attendees after the event, but we would ask, why not? 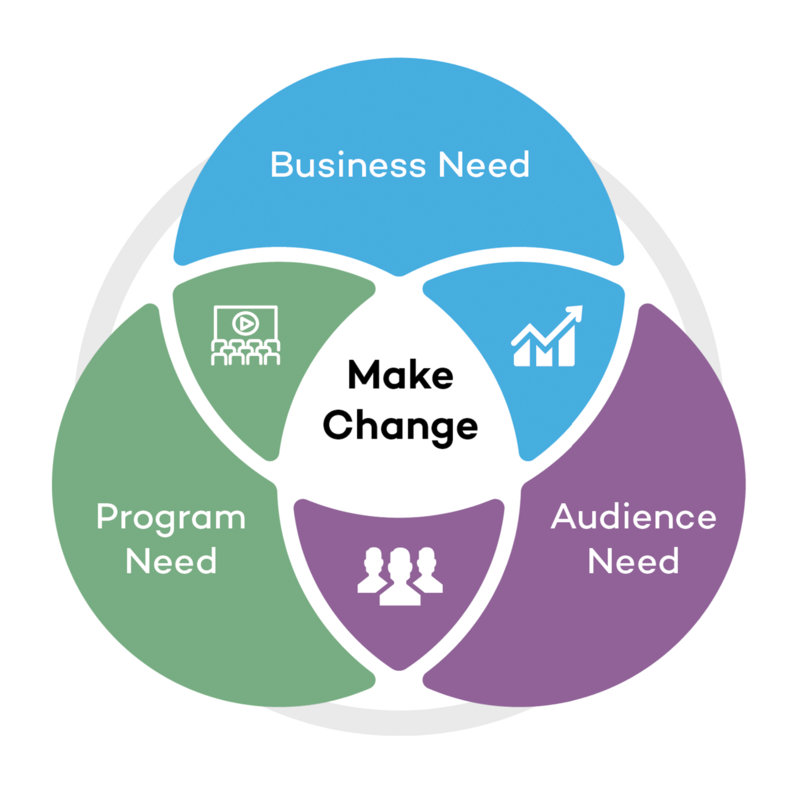 Creating this closed loop with up-front planning ensures attendees get the right messages at the right time. All too often, this final step can fall through the cracks because the focus is on getting a complex event done on time and on budget. Once the event is over, there’s little energy left to plan creative ways of following up with attendees, so it’s helpful to create that strategy up front. Hopefully, you will find these questions helpful in your search for the right audience acquisition partner. 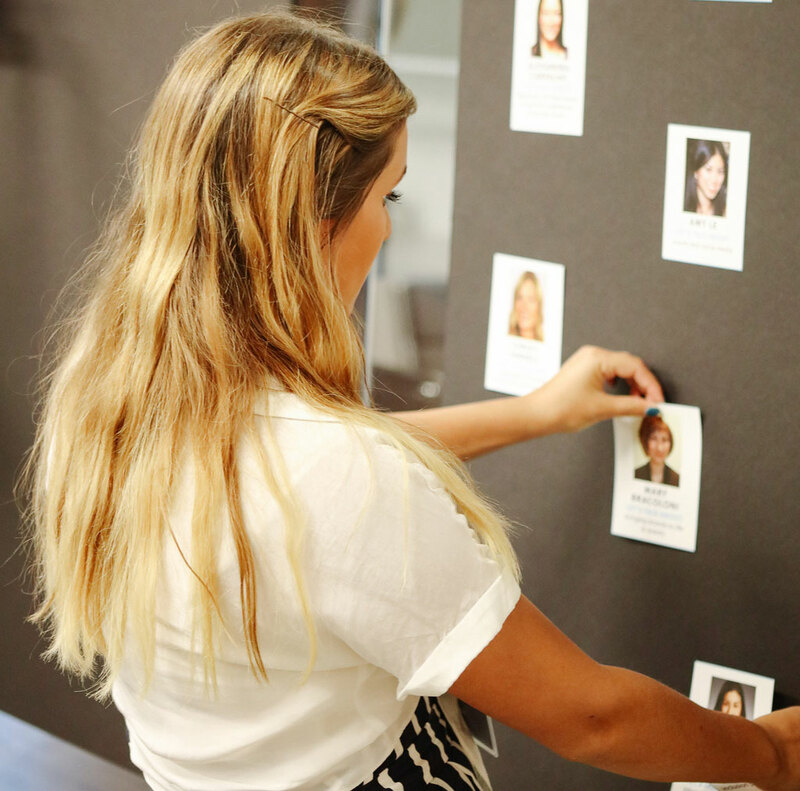 Want to learn more about audience acquisition services at InVision? Read our press release or contact us to learn all about our audience acquisition offering. The bots are taking over and if that concerns you, well, there’s a chatbot to help with that—and just about everything else. Customized, timely and relevant information at your fingertips and at your command is becoming the norm, while waiting in line at an information kiosk is becoming increasingly archaic. What can chatbots do for us in the brand engagement space? Take a look at this quick video on the basics of a bot from Gizmodo to get your bot knowledge up to speed, then continue reading to learn about how bots can take your event to the next level in technology and strategy. Attendees overwhelmingly use their mobile device for event information, and we are entering a time where the event app is starting to be replaced by a chatbot. Chatbots in all their forms (textual, visual and auditory) are flooding into the event/experiential space. Brands that have harnessed some of the power of these digital tools are clearly seeing the benefits of bot engagement and data collection, and how that data can be used to refine the attendee experience. Subsets of communications for attendees based on role, skills, interests, etc. Brands are going to want to bring their brand bots and event themes to life through avatars, brand characters and virtual humans in the event/experiential space. Augmented Reality/Extended Reality (AR/XR) and Artificial Intelligence (AI) will play important roles in bot development. Chatbots are useful technology that anyone can easily embrace. They’ve been around for ages and, as AI and mobile converge, and NPL (Nature Language Processing) gets better, they will become a seamless part of our lives. They will provide a familiar chronological user experience that keeps a simple swipe-able history at your fingertips. When developed properly, brand/event engagement will be made stronger with each brand/product/experience. These bots will become brand and event ambassadors, and remember you from event to event—and all the time in between. Bots will fill a prominent spot in an AI-enabled, post-app era and continue to rapidly grow across markets, complementing the increased use of XR through voice, gesture and gaze input that will start to rival texting in the 2020s. For more information on how we can help integrate chatbot technology into your communication strategies, please email info@iv.com. Posted in Cool Technology and Trends	| Tagged AI, AR, artificial intelligence, audience, augmented reality, avatars, bot, bots, Brand, chatbots, digital, Engagement, event, events, extended reality, Gizmodo, Jason Irwin, mobile, Technology, virutal, VR, XR	| Comments Off on Nice Bot! Anticipation builds as you move through the branded registration area and vast expo space. You look around, impressed by what you see, but you’re excited to get to the general session and take your seat. As you go through the doors, you’re swept up by energetic music and pulsing lights moving around the room. You take your seat and the lights dim, revealing a beautifully designed stage and dazzling opening media piece on the screen. The excitement is palpable, but you’re not really there—you’re in your office, thousands of miles away. You’re experiencing your event virtually through previsualization tools. InVision believes in using the power of previsualization (previs) to create smarter, more impactful events. Imagine being able to experience your event long before it even begins—getting a 360-degree preview, complete with environments, lighting, music and motion—without having to travel to the venue or build expensive sets. When applied correctly to a production design workflow, previs enhances collaborative design thinking and accelerates decision-making during the pre-production process. With previs, you can test different concepts, experiment with effects and make changes before you execute them in the real event space. You can sit in the audience or stand on the stage. You can evaluate the impact of your music, media pieces and stage designs. And, best of all, you can share this experience with key members of your team during the development process—no matter where they are in the world. So, What is Previsualization Anyway? Popular with game developers and film directors, previsualization uses 3D computer renderings and virtual reality to create a realistic visualization of how something will look when complete. By simply putting on a pair of VR goggles, you can be instantly transported into a virtual environment. As an organizer, you have the ability to visually experience an environment in a form very close to reality. You can view sightlines and first-person perspectives from the best and worst seats of the house, on stage and everywhere in between. Executive speakers can experience what they’ll see from the stage, including locations of confidence monitors and other visual aids. Dynamic lighting schemes can be integrated into the virtual space and video media files can play on the virtual screens, bringing you closer to the actual experience. Programmatic and visual decisions can be made earlier in the process, cutting the cost and time spent developing environments because key decision-makers can experience the exact same space at the same time in advance of it physically being built. Designers can design within the virtual environment, reducing costs associated with any redesigns on site. Since 2015, InVision has utilized previsualization to help our clients develop more impactful programs, work more collaboratively and streamline development costs. We’re currently working on the next generation of previs, incorporating both augmented reality (AR) and mixed reality into our previsualization tools. Let us demonstrate how to bring your event to life before it even begins. If you’re interested in learning more about how previs can enhance your planning process or if you’d like a live demo (which we highly recommend), let’s talk. Contact us at info@iv.com. InVision believes in creating captivating, transformative experiences that connect with audiences on a deeply emotional level. There’s no better way to engage an audience and convert them into brand enthusiasts than with imaginative storytelling told through beautifully executed media. For us, media constitutes a variety of elements, including video, motion graphics, theatrical effects (i.e. lighting and sound), and interactive components and technology (i.e., augmented reality and virtual reality). Before starting any media project, establish what you’re trying to achieve. When the experience is over, what do you want people to do? What do you want them to feel? Craft your messaging so the audience reacts in a certain way and develop the style of your piece to generate the feeling you want to establish. Think about style in the context of movie genres—is this a comedy, drama, thriller or historical story? Knowing what you want the audience to do and feel will inform how to tell your story. 2. Treat Media Like a Journey, Not a Destination. Effective storytelling takes audiences to a place they might not have otherwise gone. Though there is a beginning, middle and an end, the point of the story is the power of the experience itself. Use honesty and imagination as a way of getting the audience to let down their guard and get caught up in the moment. 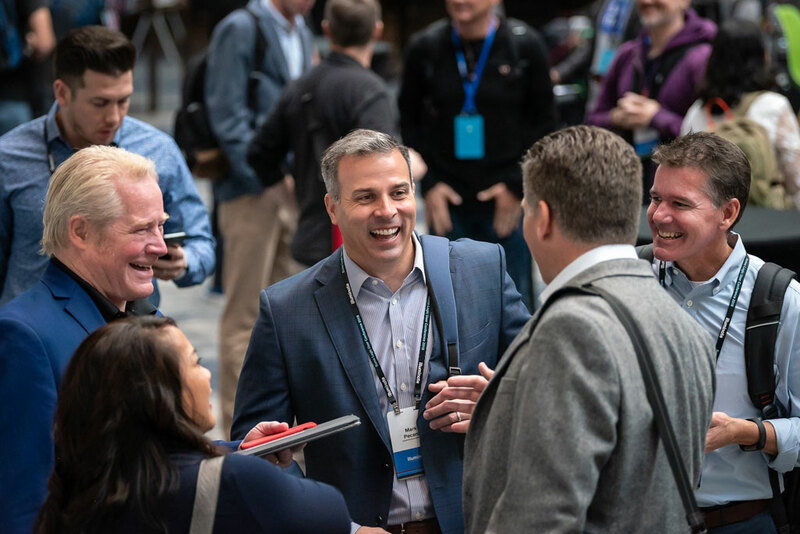 Put yourself in the mindset of the attendee, think about how you will excite and inspire them; and guide them along a path of discovery that ultimately connects them to your brand. If you’ve taken them on a compelling journey, you will have earned their trust along the way. And with brands, trust is critical to success. 3. Craft a Unique Message. Instead of creating a safe, generic message, take a stand! To win over the audience, distinguish your brand by developing a smart, creative, unexpected story—something that supports your brand story, yet separates you from competitors. Tell your brand story with heart and conviction, not marketing lingo. If you feel a personal connection with the story you’re telling, others will too. Be bold with your media design to maximize impact—when done well, it always pays off. You can be bombastic and loud, minimal and elegant, or funny and irreverent. A succinct, bold idea that reinforces your brand, yet resonates with people catapults your brand to be top-of-mind. 4. Flatter Your Audience—With Intelligence. Today’s audience is more sophisticated than ever. As this link from eMarketer shows, people absorb media all day, every day—online, offline and on their phones—which means they’ve seen it all. Audiences want to be moved and impressed, so give them original, exciting work. Whether you leverage elegance, humor or emotion, be smart about it. Don’t dumb it down. Create experiences for intelligent, observant audiences and they’ll respect your brand for it. 5. Put the Venue to Work. Where and how will the audience be experiencing the media? It’s important to understand the venue space itself. If it is expansive and spacious, use the whole room. Lighting effects, projection mapping and interactive elements, such as PixMob, can help fill out a space, making it feel more intimate. It’s also important to pay attention to running time and tempo. For example, if you’re creating an opening experience, the audience will give you their full attention; use it wisely and don’t overstay your welcome. Always leave the audience wanting more. Immersive, engaging media experiences can transform the way you connect with your audience. People love being taken on a journey, and a well-crafted story told through film/video, interactive elements, live performances or a combination thereof can boost the emotional engagement they have with your brand, your products and your people. If you’re interested in creating more powerful media experiences, let’s talk. At InVision, we’re always excited to tell brand stories in new, thought-provoking ways. Contact us at info@iv.com.